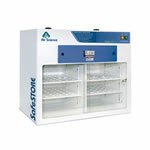 Safestore™ Vented Chemical Storage Cabinets are useful for storage of noxious or odorous chemicals. 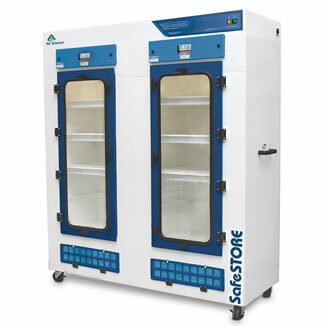 These cabinets minimize health and environmental risks in handling chemical vapors and residues, VOCs and general laboratory functions. The Air Science Multiplex™ filtration system protects the safety of personnel during use, maintenance and decontamination. Activated carbon main filter formulated for general purpose storage to contain putrid organic odors as well as fumes (i.e. alcohol, solvents, gasoline, etc.). With HEPA filter, eliminates exposure to biological particulates; see Accessories. Upflow airflow geometry operates at 120-180 FPM face velocity to exchange air through activated carbon main filter. A. Control Panel: Electronic controls and displays include switches for the blower and lights and low airflow alarm all located on a convenient front surface panel. B. Airflow Alarm: A continuous air velocity monitoring system alerts the operator upon unacceptable values. C. Dynamic Filtration Chamber: The dynamic filter chamber prevents any possible leakage of contaminated air by pressurizing the fan plenum (positive air) and depressurizing the filter compartment (negative air). D. Filter: Includes carbon filter. Optional HEPA filter available; see Accessories. 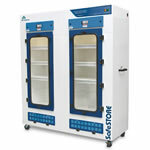 E. Construction: The standard size and tall cabinets feature all polypropylene construction, while the Safestore Mini features epoxy-coated steel construction. 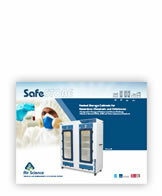 Safe to Use: Cabinet airflow and face velocity protect users from incidental exposures to fumes, odors or bloodborne pathogens. Self Testing: Electronic airflow monitoring assures continuous safety. 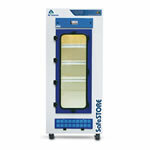 An optional filter saturation alarm (electronic gas sensor) monitors carbon filter performance on select models. 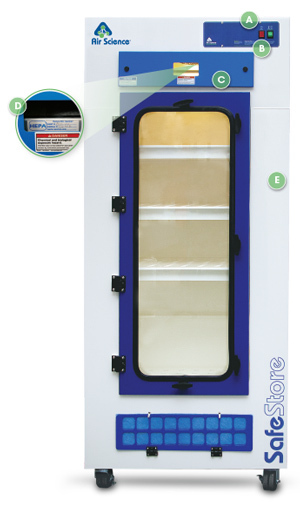 Easy to Clean: Safestore cabinets are constructed of polypropylene that does not absorb liquids, is easily cleaned with household detergents, and can be sprayed with a 10% bleach solution to eliminate biological contaminants. Construction: The cabinet features white polypropylene.